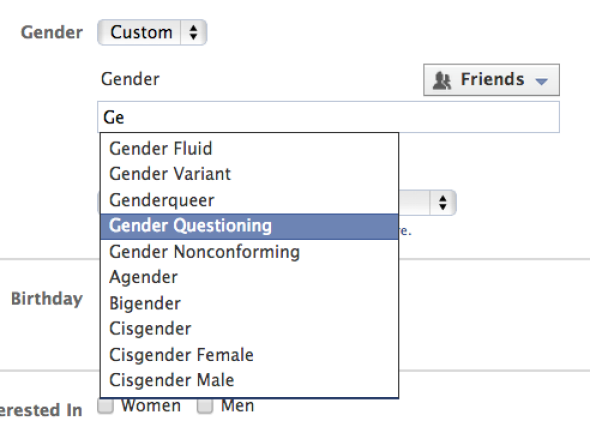 This week the big news has been about Facebooks new options for one's gender identity. It may not seem like a big thing, but providing this option to people in order t better represent themselves online is an amazing step forward in the right direction. And while there are those who choose to see the negative side in things and complain that it took 10 years for Facebook to get around to doing this or other such complaints. But really, we need to celebrate progress for its own sake. I mean come on, they've coded in 56 different options plus you can also set what pronouns Facebook will use when referring to you. The little things matter! And this comes like 3 years after Facebook provided more LGBT-friendly options for one's relationship status including "domestic partnership" among others. As much as Facebook's privacy snafus annoy me to heck, I do appreciate how they're taking steps to better represent their LGBT members. And when a social media platform as big as Facebook makes changes like this, it certainly sends ripples throughout the tech community that get more people thinking about how they want to handle LGBT concerns as well. So good job, Facebook! Now all we need is for you to get your act together in terms of your News Feed filtering.